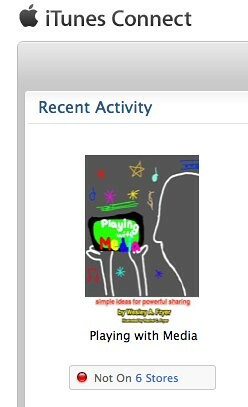 Yesterday was a day of great joy in the Fryer household: At long last, the eBook I’ve been rather obsessively writing for the past few months (“Playing with Media: simple ideas for powerful sharing“) was finally published in the United States, the United Kingdom and Germany in the respective Kindle stores for each country. I had uploaded the “standard” EPUB version which I created using Apple Pages ’09 software to the Kindle Direct Publishing (KDP) website, and let the site convert it to the proprietary Kindle “AZW” format. Everything looked good in the preview after I uploaded it, but once the book actually “went live” and I downloaded a preview I noticed the table of contents was not available. It turns out the KDP EPUB conversion process doesn’t include a table of contents. The iBooks application on the iPad does dynamically create a table of contents when viewing EPUBs, so it was disappointing to learn (at least at this point) direct EPUB conversions on the KDP site aren’t complete. To remedy this, I shared the issue on Twitter and also posted to the KDP community website. 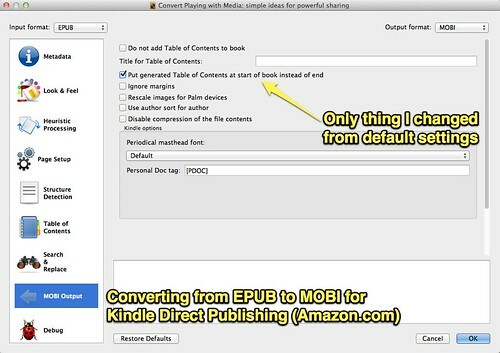 Charlene Chausis (a fellow ADE and guru when it comes to EPUBs) answered my call for help, suggesting I convert my EPUB version to MOBI and then upload that to Amazon. Charlene also confirmed Calibre (a free, open source eBook conversion and management program) maintains the table of contents when making the EPUB to MOBI conversion. I did this tonight, and used all default Calibre settings except one: I chose to put the generated Table of Contents at the start of the book rather than the end. I haven’t had any luck publishing either my “standard EPUB” or “multimedia EPUB” on Lulu. 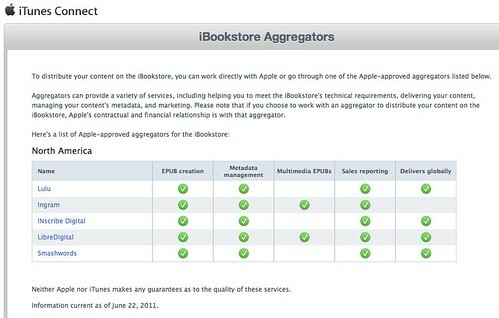 From what I’ve read on various sites, it sounds like they have a very stringent EPUB validation process and it may include some requirements Apple doesn’t… and they may do this to encourage people to use their commercial EPUB conversion services. I’m not sure if that allegation (which I read a few places) is correct or not, but I DO know the EPUBs which I exported right from Apple Pages did NOT pass muster on Lulu. Rather than spend time troubleshooting why and how to fix the problem, I’ve explored other options. LibreDigital sounded initially like a good option to check out, but the fact that they take 15% of gross revenue from an author made them seem less desirable or needed. As a result, this evening I’ve gone through the steps to publish my EPUB directly on the iBookstore. Here are a few observations and lessons learned. First of all, Apple provides a downloadable, Mac-only application content publishers must use to post content for sale on iTunes. The software application is iTunes Producer. Interestingly, the English WikiPedia article for “iTunes Producer” has been deleted as of this writing. I’m guessing it will be restored and further developed in the weeks ahead. Sometimes this happens with new Wikipedia articles. 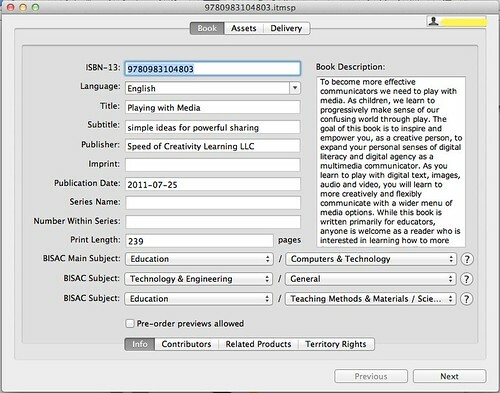 Basically, iTunes Producer is used to enter all the META information for your eBook, along with the actual EPUB file and cover art. 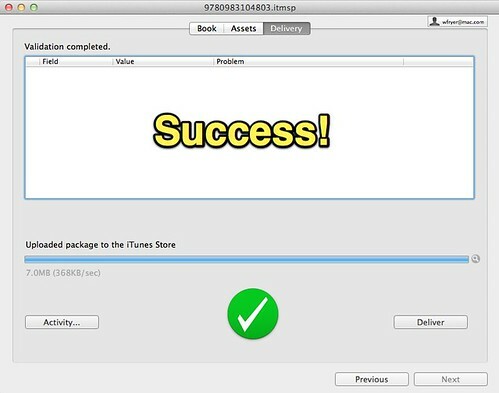 The program validates your EPUB format and uploads (delivers) your “package” of content to iTunes. Prior to using iTunes Producer, however, I had to setup all the contract details for my account with Apple. This included my business name/address, tax ID number, and bank account. I had to certify agreement with Apple’s iBookstore and iTunes, which means (among other things) they’ll keep 30% of gross revenues from my book sales. You might notice I chose to make the book available DRM free. This doesn’t mean I don’t want to make money from this eBook… I certainly do. I have very mixed feelings about DRM, however, and generally support open content sharing. On Amazon as well as Barnes & Noble, when you initially publish an eBook you have to decide if you want to use DRM or not. That decision can’t be changed on Amazon or B&N once you set it. I didn’t use DRM on any of the three sites. If you’re not familiar with DRM (“digital rights management”) the English WikiPedia article on it is pretty thorough and worth reading. One thing I wasn’t expecting was the option to include a “preview” file of my book. Amazon did this automatically, giving the first twenty pages or so of my book away as a “sample.” Apple’s iBookstore lets you specify if you want a preview/sample version and what to include. I chose to include the first ten pages of my third book chapter on “Audio.” I copied those pages into a new Pages document and exported that as a new EPUB I included in iTunes Producer. 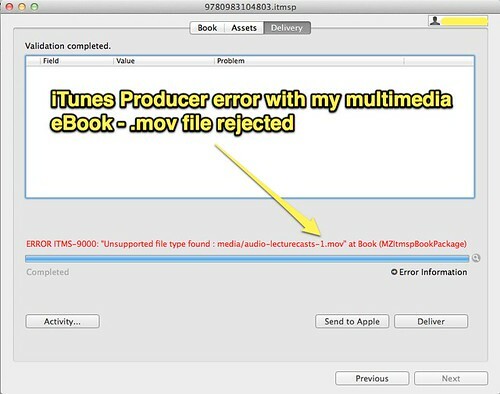 The big surprise (and disappointment) when I finally clicked ‘DELIVER’ in iTunes Producer was the following message, which indicated an illegal / unsupported video file was included in my eBook. This seemed very strange, since the 17 videos and screencasts I’ve included in the multimedia version of this book play fine on my iPad when I preview them. 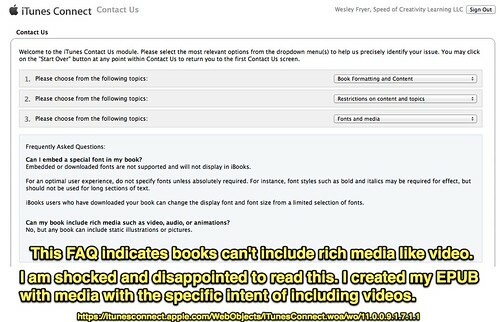 I did some research on the iTunes Connect website, and found the following FAQ which inexplicably states rich media files (including videos) CANNOT be included in iBookstore EPUB eBooks. I submitted a question about this to the iTunes Connect team at Apple, and also asked the LibreDigital employee who I’ve been communicating with and inquiring about their services to explain this. That LibreDigital person had recommended I offer the multimedia EPUB version at a higher price than the standard version, so it MUST be possible to publish EPUBs with videos. Hopefully I’ll learn the answer to this tomorrow. It’s possible I need to change the file format of some or all my videos, but since THEY WORK NOW on my iPad that doesn’t seem sensible. My best guess at this point is Apple is requiring publishers to work with certified aggregators like LibreDigital when publishing multimedia eBooks. That may not be right either. Tomorrow I should find out and I’ll pass along what I learn. If you have insights about this please share them as comments. 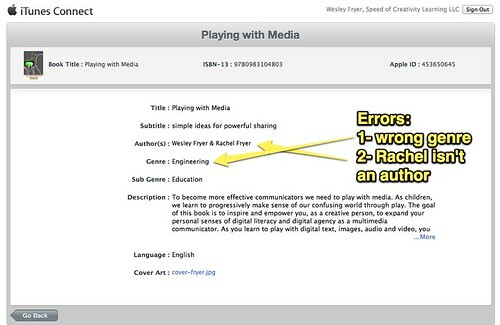 Since I ran into this problem, I decided to upload the “standard EPUB” version of my eBook to iTunes. That version uploaded fine without errors or problems. 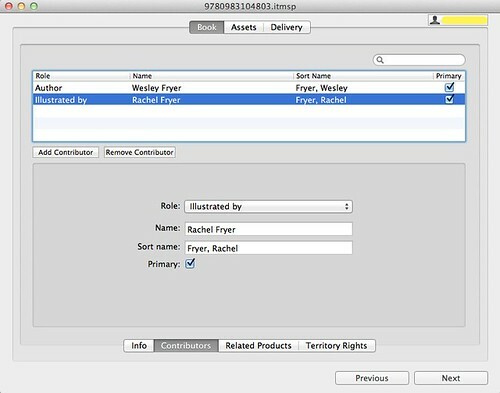 I did end up changing the META info for the book, since (although I thought I’d chosen it as a subcategory) iTunes Connect was showing my book categorized as “Engineering.” It also showed Rachel (my daughter and book illustrator) as a primary author, so I tried to fix both these problems. I updated this and just stuck with educational book categories. That worked, and the META info looks good now. I did purchase my ISBNs separately and directly a few months ago. Technically you are supposed to have separate ISBNs for each book format you publish, so a Kindle version needs a different ISBN than an EPUB version published in the iBookstore. 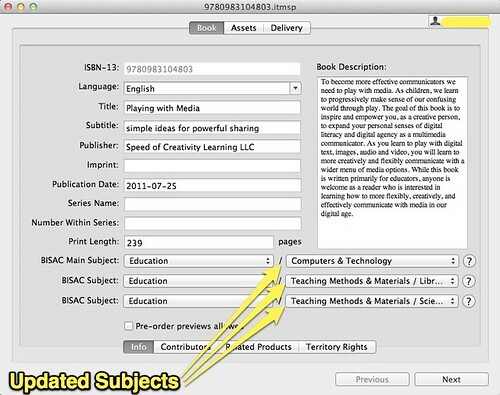 EpubBud will sell you an ISBN for just $5, but they are the book rights owner in the ISBN directory. This might not matter for some folks, but I wanted to be the owner / publisher of record for this book… so I bought the ISBNs. It took several days for Barnes and Noble to approve my account to publish my standard EPUB on their Nook eBookstore, but as of this evening I’m delighted to report it’s for sale there! I’m going to head to our local B&N in Oklahoma City this weekend and give the book a “test drive” on a Nook eReader, since we don’t own one. Hopefully the standard ePUB version of the book will be available later Friday in iTunes. 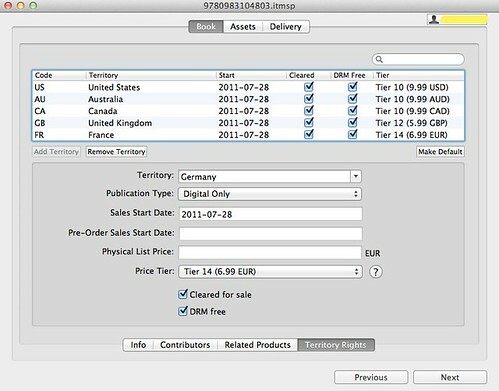 The six countries I’ve authorized for iTunes sales (all now available to me) are Australia, Canada, France, Germany, the United Kingdom, and the United States. 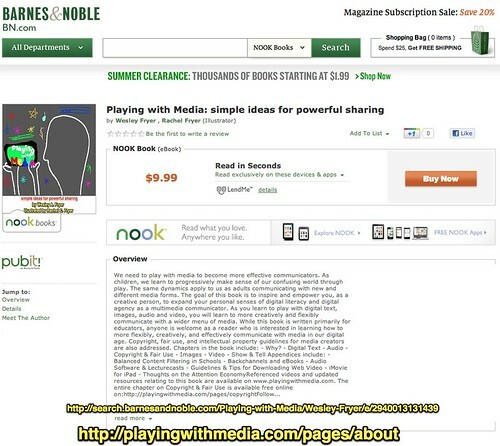 I’ve added links to the Amazon Kindle Stores and B&N pages for the book on my main Playing with Media Posterous site. This is an exciting process! Remember you can stay up to date with “Playing with Media” by liking the Facebook page I’ve setup for the book. I’m planning to record an audio podcast of some eBook writing and publishing lessons learned soon. Hi Wesley. I’m an italian media educator and I like very much your work. I’m looking forward to reading the multimedia version of your book. Please try to find an alternative delivery channel spoon. 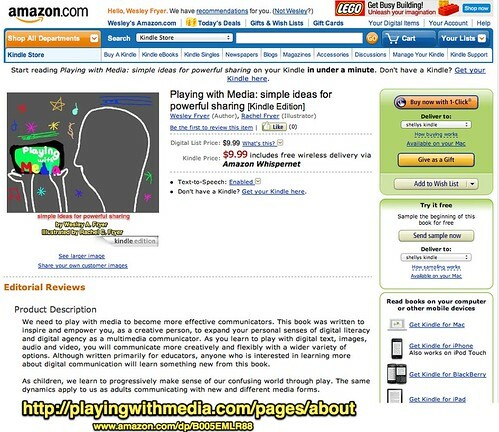 Maybe on Kindle Store (which sells enhanced ebooks) or directly on your website, as suggested by Charlene. Hi there. Thanks for all this information. 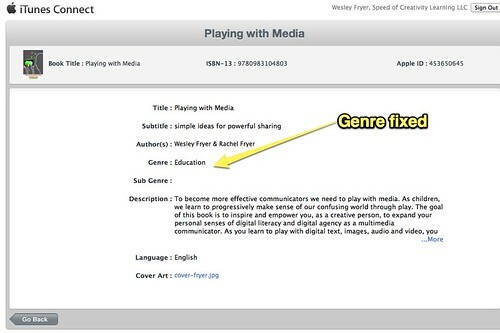 Did you ever find out if it is possible to add a video in the Epub for the Itunes store? I am surprised as you are that it plays on my ipad but seems to not be allowed in the epub. Thanks! I haven’t found a software reader, however, that will play enhanced EPUBs. I know the Nook Tablet now supports embedded videos, and I assume they are embedded EPUBs but don’t know for sure. In the summer of 2011 EPUBs submitted to B&N via their PubIt site were limited to 25 MB total, which rules out video-embedded EPUBs. Hi. I just publish a book on Lulu for a client. The formatting probably matches what you have on Amazon. You can give it a try, and Lulu will tell you what you need to change, or they will tell you what they changed for you. The TOC is a pain. Lulu says if you format headers correctly it will create a hyperlinked TOC for you, but I didn’t experience that.